Services are scheduled for 10 a.m. Thursday, Nov. 19, at Our Lady of Grace Catholic Church for Zenaida Pedroza of Artesia. 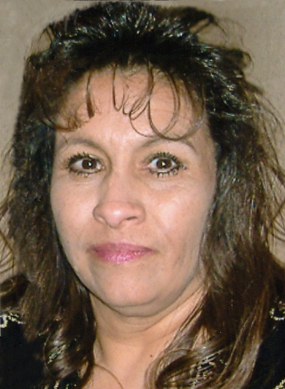 Pedroza, 51, passed away Saturday, Nov. 14, 2015, at Artesia General Hospital. Fr. Martin Cornejo, OFM, will officiate at the services, with interment to follow at Woodbine Cemetery. Pallbearers will be Eddie Garza, Pablo Ramirez, Ryan Buendia, Lalo Sonora, David Pedroza and Daniel Boone. Pedroza was born Oct. 3, 1964, in Carlsbad, the daughter of David J. Pedroza and Rosa (Romo) Pedroza. She was a longtime Artesia resident. She was a supervisor at Yates Petroleum for 16 years and, before that, was a CNA. She was a member of Our Lady of Grace Catholic Church. She enjoyed crafts and sewing, and loved to go to the casino and spend time with her family. Survivors include daughters Michelle Pedroza-Hernandez and Jessica Pedroza-Hernandez, both of Artesia; son Pablo Pedroza-Ramirez of Artesia; grandchildren Ryan Buendia Jr. and Janay Buendia, both of Artesia; her lifetime partner, Eddie Garza, of Artesia; mother Rosa Romo-Pedroza of Carlsbad; sisters Ernestina Lara, Francisca Olivo, Lydia Fuentes-Pedroza, Aurora Sonora and Beatrice Madrid, all of Carlsbad, and Angelita Sifuentes of Roswell; and brother David Pedroza Jr. of Carlsbad. She was preceded in death by her father; son Martin P. Grado Jr.; and sisters Albina Hernandez, Maria Elena Navarrette, Antonia Madrid, Teresa Chavez and Felicita Acosta.